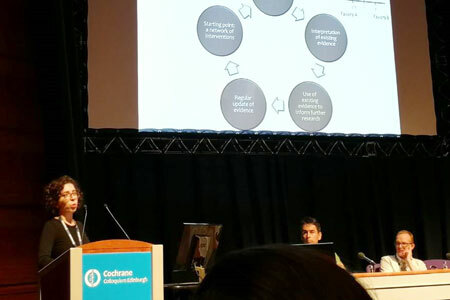 The award is given at each Cochrane Colloquium to the principle author of the best oral and best poster presentation addressing methodological issues related to systematic reviews given by an early career investigator. Presentations must demonstrate originality of thought, high quality research, relevance to the advancement of the science of systematic reviews and clarity of presentation. In her presentation entitled ‘The emerging evidence synthesis tools: Actively Living Network Meta-Analysis’, Adriani described the concept of an actively living network meta-analysis which combines ideas of living systematic reviews, network meta-analysis and evidence-based sample size calculations. The suggested framework resulted from research on the project Evidence-based planning of clinical research (EBAR) which received funding from the European Union’s Horizon 2020 research and innovation programme under the Marie Sklodowska-Curie grant agreement no 703254. The research team included Sven Trelle, Matthias Egger and Georgia Salanti.